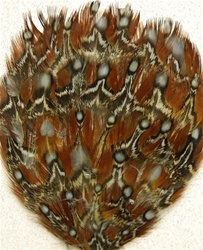 RED Pheasant Pad. This distinctive Pheasant pad is made from the RED PHEASANT BIRD. The look of this bird is not found elsewhere. Very popular for a different look in Millinery, Headbands, Crafts and Fashion. Also can be used in many various accsesories. Sold by the DOZEN only.